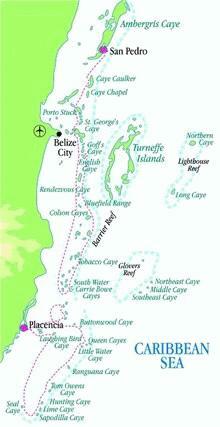 The main office in Belize is located in the quaint little fishing/diving community of San Pedro on Ambergris Caye. It is only one block from the airstrip so a $5 cab of your choice will manage your luggage and occasionally guests too, for the two-minute ride either to your hotel or directly to the yacht. If time allows, the staff will complete the boat and chart briefing, assist you with provisions and where to eat out before calling it a day. Usually begins with a hearty breakfast so you won't have to stop for lunch. Chart briefing at 9am while everyone makes all final preparations to set sail. We take you out to give you a brief lesson on reading our waters as this is the best aid you have to navigate our rich banks of coral. If you get away by noon you'll have time to snorkel right out front, before setting sail to Caye Caulker, two hours due south. Drop the hook and reward yourself with a cocktail over another beautiful Caribbean sunset. Enjoy your last chance at a choice of restaurants on laid-back Caye Caulker. This is also your last chance to purchase provisions unless you have over eight days and can reach Placencia. Heading South, you'll pass Caye Chapel with its 18 hole golf course, new condominiums, but little else to see or do. This island is privately ownedand not yet open to the public. You then pass through your first shallow channel, "Porto Stuck". The monohull "skid marks" tell you where not to go, and the rest is easy! You can now either stop early around St Georges Caye or catch it coming north, and head on past the Drowned Cayes south of Water Cay to snorkel or loaf on Goff's Caye's beautiful sandy beach. Leaving your anchorage at Water Caye, you'll motor south past the coral heads that are in-between you and the "South Pacific" island of Rendezvous Caye. This also lies on the reef and has all the beauty of Goff's Caye, only it is blessed with deeper waters all around and therefore more coral both for snorkeling and scuba diving. 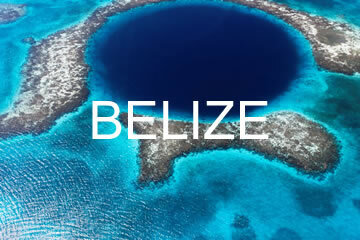 It too has a pretty beach and is surely the reason why you came to Belize…an idyllic and deserted tropical island of breathtaking beauty. Leave with enough light to avoid the numerous coral heads that lie all around. South Water Caye, four hours south is your next stop, but if you wish, there is a fine anchorage nearby at Bluefield Range or Colson Caye. Snorkeling is superb all along the reef to South Water Caye and it is here that we recommend slowing down the pace. The diving here is so good that the Smithsonian Institute has a research center on tiny Carrie Bow right nearby. Here you’ll find more good beaches, diving, windsurfing, kayaking or manatee watching at the Twin Cayes. You'll find another chance for a dinner out with two choices here and one more up at Tobacco Caye. This area is about to become another National Marine Park, for very good reason. Since it's very tricky sailing north along the reef, we recommend sailing up the inner channel, which takes all the risk out, and yet still allows you time to stop at any islands you missed heading south. We recommend ducking back into the lee of the islands along the reef for your next night and perhaps buy some more fresh seafood from the friendly local fishermen you'll see quite often. Another "tough day in paradise" with equally tough decisions to make... “More fascinating snorkeling? 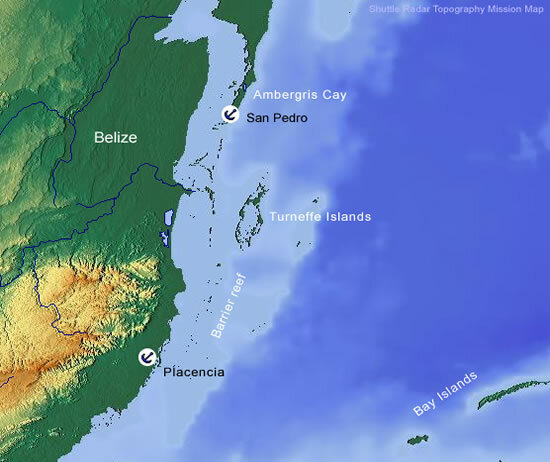 Or should we find those elusive manatees amongst the Drowned Cayes?" Want dinner out again? Try St Georges Caye where you will have two other big choices to make. This is cottage country for wealthy Belizeans from the big city so although there are lots of homes, few are ever there. This is where the Baymen fought off the marauding Spaniards for the last time. With no more than a couple of cannons and a raft, the Baymen won freedom for British Honduras forever! And much more we'd love to tell you about!